I’m not really used to revivals. I’ve been in them before, but not a whole lot. When our pastor dropped the bomb that not only would we be doing a revival this year, but we’d also have a ton of work to prepare for it and would need a lot of money from our different ministry budgets to pull it off…I was not initially overly excited. All “revival” meant to me was an evangelist coming into your church to preach a shallow gospel, to twist people’s arms to believe in Christ, and to sing an invitation song with 15 choruses to manipulate people to walk down the aisle. This revival “HarvestFEST” that God had in store for us was totally different. We had an incredible speaker, Dr. Ronnie Hill, come in. Ronnie is especially known and gifted for speaking to teenagers. So our pastor told me that it was youth who Ronnie would more naturally reach. He was right. This dude was good. I got him into a couple of schools to speak with about 250 students before school…at 7am. Many students received Christ there. Then we invited those student, and along with our church students inviting their friends, we had around 600 teenagers counted who came to revival this past week. The best part about it all was that He really challenged our students to bring in their friends for our “Student Night” on Tuesday night of HarvestFEST. We weren’t sure what to expect, but God used our students to bring in about 225 students (our student ministry normally has about 75). We fed them all pizza, and then hurded them into the HarvestFEST service to hear the gospel. Ronnie preached the strongest and most compelling presetation of the gospel I have ever heard for teenagers. He preached the gospel and invited them to receive Christ, but he also warned them. He warned them that if they weren’t going to live for Christ, then they didn’t want what he was talking about…if they were going to keep sleeping with their boyfriend or girlfriend, then they didn’t want what he was offering them…if they weren’t going to be discipled and be a part of a church, then they didn’t want what he was offering them. Then after weeding out the non-serious ones, many of them gave their lives to Christ by repenting of their sin, believing in Jesus’ death and resurrection for them, and calling on Jesus to be the Lord of their lives. Here are my personal reflections…finally. When I worked in telemarketing, I was taught the “assumptive close” which meant the more we would assume the person on the other end wanted to buy the NY Times Newspaper, the more chance we would have of selling them one. Ronnie didn’t necessarily make an “assumptive close” with lost people, but he help them as much as possible for them to receive Christ since they don’t know how…since they are lost! From the opposite perspective, to make sure that all decisions are totally genuine, I have been making it too difficult for lost people to receive Christ. During our student worship services on Wednesday nights, I have been asking students to raise their hands if they were interested in learning more about being saved in Christ. If students raised their hands, I simply encouraged them and left it up to them to come and talk to me or a leader after the service so we could lead them to Christ. Here’s what I’m thinking now… I’m thinking I need to be as helpful as possible for them. I’m now thinking that I need to make sure and give them the ESSENTIAL elements of the gospel so that they can pray and receive Christ in their seat. So giving them the elements of repentance from sin, belief in the death and resurrection of Christ, and calling on Christ to be their Lord…that is the direction I want to go. Then, like Ronnie, I will ask if anyone has done that, to look up at me so that I can encourage them in their decision to receive and follow Christ. That’s what I’m thinking through. I need to streamline this a little better so that I won’t take several minutes, but I want to help lost people come to know Christ as much as I possibly can. 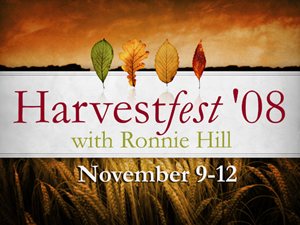 To be honest, HarvestFEST with Dr. Ronnie Hill was the best revival experience I’ve ever been a part of. If you ever need a great, solid, real, genuine, and gospel-centered evangelist in your church…you need to look him up!